Learning to sail in a Sabot, Minnow, O’pen BIC or Optimist — which is better? 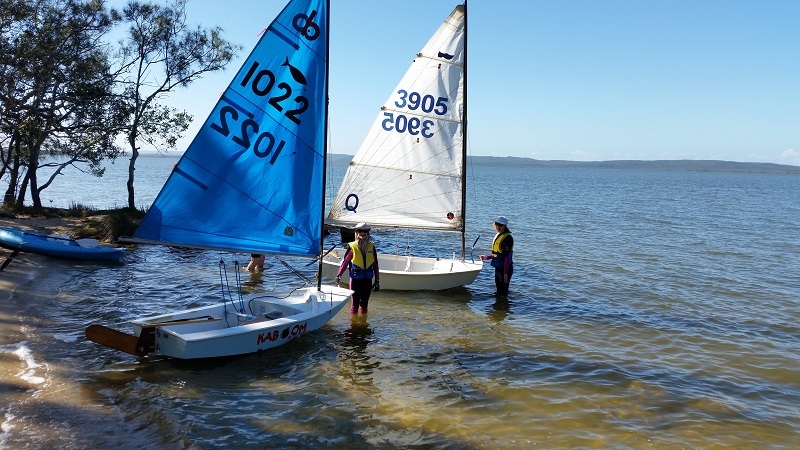 The Sabot, Minnow, O’pen BIC or Optimist are all popular junior training sailing dinghies in Australia. You want your child to learn to sail, but which boat should you buy? My daughters setting sail in their Sabot and Minnow on Lake Cootharaba. Let me declare my biases first. I learnt to sail as a junior in a Sabot. We now own a Sabot and Minnow which my daughters have recently learned to sail in. I have sailed both dinghies. I have also sailed O’pen BICs, but not owned them. I have not sailed an Optimist myself and do not own one, although my sister’s family owns an Optimist in Melbourne. The rule of thumb is to sail what other people in your club are sailing. The preferred junior dinghy at your sailing club is likely well suited to the prevailing conditions and will generally have good support from club members. If you have already chosen to join a sailing club, which boat is most popular in the junior sail training program? If you have yet to join a sailing club, then the dinghies sailed at various clubs may influence which club you choose to join. Is your child an absolute beginner? If so, then the more stable Sabot, Minnow or Optimist are going to get your child sailing independently quicker. If your child is already a developing sailor, then the faster, better looking, but less stable O’pen BIC may be a good option. Do you have international competition aspirations for your child? [Really? — Rex.] If so, then the Optimist or O’pen BIC are the only two junior dinghies that offer this option. However, the Sabot and Minnow both offer Australian State and National Titles, with the Sabot also having selection trials in regions throughout Australia. For reference, the table below provides a comparison of the main measurements for each class of sailing dinghy and a few comments on each. Sabot LOA 2,400 m (8′) 1,140 mm (3′ 9″) 43 kg 4.1 m2 160.5 Very popular dinghy at most Australian sailing clubs. Stable for beginners, but highly competitive for advanced sailors. Fills with water after capsize requiring bailing or using the self bailer, which is a slow process. Unlikely to turtle in a capsize. Minnow 8.00′ / 2.44m 4.00′ / 1.22m 22.25 kg 4.64 m2 168.5 Stable and comes up relatively dry after capsize. Self bailer will drain the rest of the water. Prone to turtle after capsize if not righted quickly. Popular dinghy for many Australian sailing clubs. 3.8 m2 sail is also available 153.3 Relatively new dinghy design that is becoming popular. Pathway for international junior competition. Self draining open cockpit. Sit on, rather than sit in boat. Unstable for a total beginner. Fastest boat in the hands of a skilled junior. LWL 2,180 mm (7′ 2″) 1,120 mm (3′ 8″) 35 kg 3.3 m2 (sprit rigged) 170 Most popular junior training dinghy in the world. Pathway for international junior competition. Comes up full of water after capsize. No self bailer, so requires manual bailing. 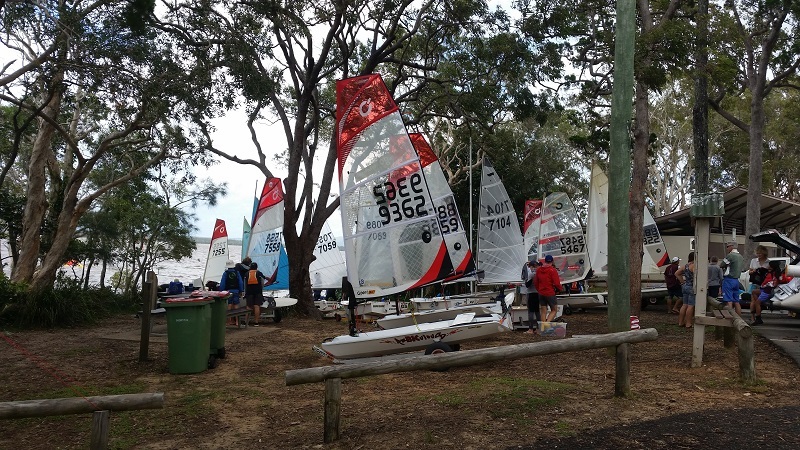 O’pen BICs, Sabots and Minnows nestled under the trees getting ready to race at the Lake Cootharaba Sailing Club Easter Allboats Regatta. Buy the boat that your sailing club uses in their junior sail training program. If you do not like the type of boat the junior program uses to sail, then it may be time to change clubs. Both Sabots and Minnows have fleets around Australia, with the Sabot having the stronger program nationally. Both boats are a great choice for a junior beginning sailor. My experience with O’pen BICs has been that they are really not suited to absolute beginner junior sailors. They are a lot less stable than a Sabot, Minnow or Optimist requiring more skill just to stay upright. Beginner O’pen BIC junior sailors will likely spend a lot of time in the water and get very good at capsize recovery! Some kids will enjoy this; most kids will not and will get turned off the sailing experience. Interestingly, at our last sailing club regatta, well sailed Sabots easily beat the less experienced sailors in the O’pen BIC fleet, particularly when handicap was taken into consideration. In many respects, the Optimist is the junior training sailing dinghy that has the best formula. New boats can be purchased for not too much money (comparatively speaking) and each new boat is identical to the next eliminating the chequebook battle of parents. And when your kids have grown out of the dinghy it can be sold for not too much less than you spent. While many parents despise Optimists and refer to them as ‘bathtubs’, the fact is, kids can have a huge amount of fun sailing together in stable, closely matched one design boats like the Optimist. Optimist sailing dinghies are the most popular class of junior training dinghy throughout the world and there is a reason for it. Finally, let your kids enjoy sailing. Don’t be the ultra competitive parents on the shore pushing your children if they do not want to. Many children, my own included, are simply happy to sail for the shear joy of it, not to win a championship. This entry was posted in Sailing and tagged Dinghy, Minnow, O'pen BIC, Optimist, Sabot, Sailing on 24 February 2018 by Rex. Good comparisons, the Bug is another nice learner dinghy.